One of the projects we maintain at Free Law Project is a database of reporters of judicial decisions. This database has been popular among developers, but we’ve heard that the data was hard to work with. To fix this, we created a new CSV of the data that is available now. It currently has 440 reporters. Any series that the reporter has, for example, a 2d or 3d. Any variations that the abbreviation for the reporter may have. For example, Kentucky Reports can be cited variously as, “B. Mon.”, “Ky.(B.Mon. )”, “Mon.”, “Mon.B.”, or “Monroe, B.” We have nearly 1,000 of these so far. The start and end dates for each series of each reporter. The jurisdictions covered by each reporter. Together, this information is vital for creating citators and for identifying what decision a citation actually refers to. Robert Ambrogi recently wrote an article about our new judicial database for his LawSites blog. 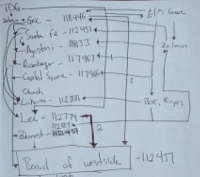 In his article, he makes a few concrete observations about our judicial database, and I want to use these observations as a launching point to talk some more about what we have made, why it is useful, and what we are working on next. 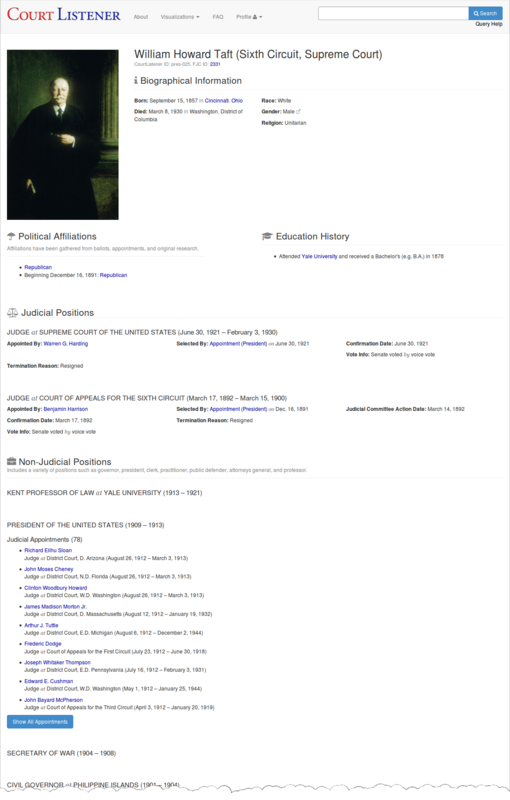 Our page for Justice Robert Cordy is sparse compared to the same page on Ballotpedia. Scalia’s end date was not set for his time on the Supreme Court, and his education data was not quite correct. These kinds of observations are really important to us, and it shows that we still have work to do building and explaining our work. In February we announced our Supreme Court Citation Network tool that we developed with University of Baltimore School of Law. We haven’t had a chance until now to comment on some of the technical difficulties that came up while we were working on it. If you’re not familiar with this tool, you should take a moment now to go check it out (gallery, homepage). In this post I’ll be talking about the challenges that we overcame in order to efficiently generate these visualizations. If you like what you read here, you might want to vote (hint, hint) for Colin Starger’s talk at the Cali Conference. A goal at the start was to create a system that could quickly generate these diagrams in response to a user’s request, without resorting to any kind of “please wait” mechanism such as a spinner () or any other tricks that might frustrate our users. 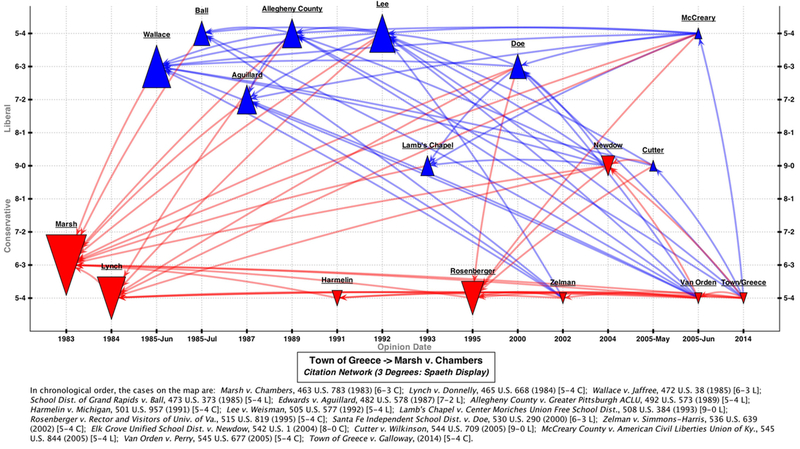 This would turn out to be a very difficult goal beacuse of the nature of citation networks. Just a quick post today to share that our oral argument podcasts are now available on Google Play Music. If you are a user of Google Play Music, you can easily subscribe to our podcasts by searching for “Free Law Project”, “CourtListener”, or simply, “oral arguments”. Once you subscribe, the podcasts will download to your device if you use one, or will be playable via the website. These podcasts contain all of the oral argument audio for a given court or for a search that you create. This means that in 2016, you can literally pipe the audio from the Supreme Court and Federal Circuit Courts directly to your pocket. In honor of this announcement we’ve created a new page on our site that lists our existing, pre-made podcasts, explains how to make custom ones, and explains how to subscribe to them in Google Play Music or Stitcher Radio. We hope you’ll enjoy these podcasts. Who doesn’t want the Supreme Court piped to their pocket? Today we’re extremely proud and excited to be launching a comprehensive database of judges and the judiciary, to be linked to Courtlistener’s corpus of legal opinions authored by those judges. We hope that this database, its APIs, and its bulk data will become a valuable tool for attorneys and researchers across the country. This new database has been developed with support from the National Science Foundation and the John S. and James L. Knight Foundation, in conjunction with Elliott Ash of Princeton University and Bentley MacLeod of Columbia University. At launch, the database has nearly 8,500 judges from federal and state courts, all of which are available via our APIs, in bulk data, and via a new judicial search interface that we’ve created. Biographical information including their full name, race, gender, birth and death dates and locations, and any aliases or nicknames that a judge may have. Free Law Project is now offering legal data services to answer difficult questions and generate custom data reports. Working on complex software with a lot of dependencies can be difficult, and over the years many people have struggled to install and configure all the complex components CourtListener requires. Our previous solution to this was to create and maintain the Free Law Virtual Machine, which allowed people to work in a VM with all the right software installed. Alas, keeping the VM maintained was a real burden and we weren’t the best at it. It fell into decay and without realizing it we informally stopped recommending people use it. Today we have a new, more modern solution using Vagrant. We’re getting the last of the kinks out of the new system, but already a number of people are using it in their daily process. It has all of the dependencies installed and configured. Best of all, although your code will be running in a virtual machine like before, when you’re using this setup, you still get to use all of your favorite tools on your local machine. If you haven’t used Vagrant before, you’ll find it’s a rather magical experience. We here at Free Law Project are happy to announce the launch of our Supreme Court Citation Network tool. Created in collaboration with the SCOTUS Mapping Project at the University of Baltimore, the tool permits users to create citation networks that represent “lines of cases” in Supreme Court doctrine. 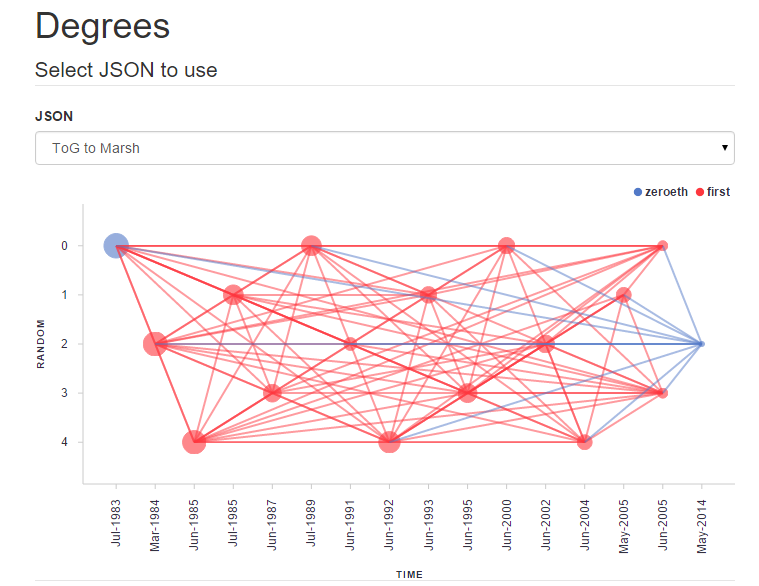 With the tool, users can also visualize, analyze, and share the networks they create. Consider the network above. It was created with the tool and embedded directly into this post. 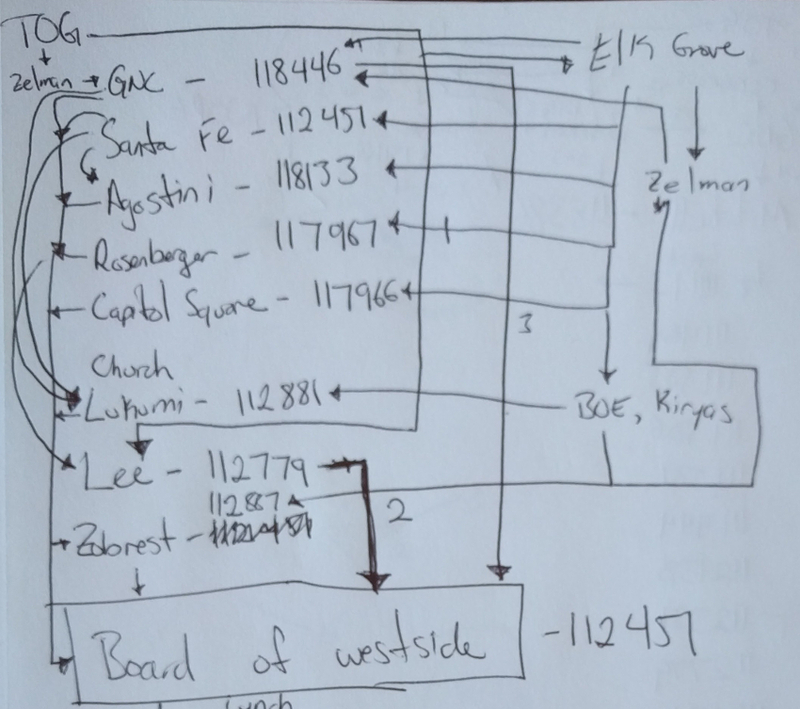 Similar to a YouTube video, you can interact with it, hovering on the nodes to see the full case name, or clicking them to open them in a new tab. Of course, you can also open the visualization in its own page, where you’ll find more detail and analysis. The visualization leverages Supreme Court Database (Spaeth) to show a surprising fact about the recently departed Justice Scalia: He was a liberal on the Fourth Amendment. The map is anchored by two Scalia opinions in which the supposedly conservative justice sided with an accused marijuana criminal — Kyllo (protecting weed grower from warrantless thermal imaging search) and Jardines (protecting weed grower from warrantless dog sniffing search). We want to share some quick statistics today. We we just completed running our citation parser across the entire CourtListener collection. 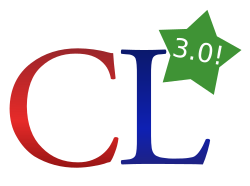 If you follow our work, you’ll know that the purpose of the citation parser is to go through every opinion in CourtListener and identify every citation from one opinion to another (such as “410 U.S. 113“). Once identified, the parser looks up the citation and attempts to make a hyperlink between the opinions so that if you see a citation while reading, you can click it to go to the correct place. The process ran continuously for two weeks. It ran a total of 253,872,460 queries against our search engine. It found 25,471,410 citations between opinions. 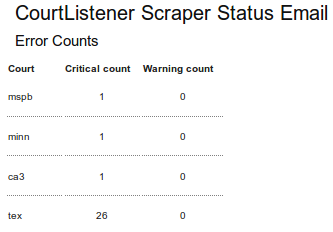 There are about three million opinions currently in CourtListener. It is now browsable. Go check it out. You can click around the API and peruse the data without doing any programming. At the top of every page there is a button that says Options. Click that button to see all the filtering and complexity that lies behind an API endpoint. It can be sampled without authentication. Previously, if you wanted to use the API, you had to log in. No more. In the new version, you can sample the API and click around. If you want to use it programatically, you’ll still need to authenticate. It conforms with the new CourtListener database. More on this in a moment, but the important part is that version 3 of the API supports Dockets, Opinion Clusters and Sub-Opinions, linking them neatly to Judges. The search API supports Citation Searching. Our new Citation Search is a powerful feature that’s now available in the API. One of the great new features that the new version of CourtListener provides is what we’re calling Citation Searching. Citation Searching lets you look at all the opinions that cite an opinion you’re interested in and then slice and dice them so that you only see the ones that are important to you. For example, say you’re looking at Roe v. Wade and you want to analyze the cases that have cited it. In CourtListener, in the sidebar on the left, there’s a list of the opinions citing the one you’re looking at, in the section called “Cited By”. 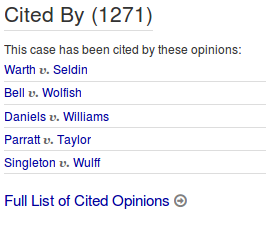 At the bottom of that section, there’s a link that says, “Full List of Cited Opinions”. If you click that link, you’ll be taken back to the search results page, and you’ll see that your query is for cites:(108713). The number in there is the ID of Roe v. Wade that you can see in its URL. This is just standard CourtListener search syntax, so you can tweak it however you like. While working on a soon-to-be-released feature of CourtListener, we needed to create “short form” case names for all the cases that we could. We’re happy to share that we’ve created about 1.8M short form case names, including complete coverage for all Supreme Court cases going back to 1947, when the Supreme Court Database begins. When using only one party name in a short form citation, use the name of the first party, unless that party is a geographical or governmental unit or other common litigant. It’s taken the better part of a year, but I’m thrilled to announce that a new and better version of CourtListener is live as of this moment. If you can’t tell the difference immediately, we see that as a good thing, since most of the enhancements are under the hood. The most important changes in this version have to do with the database, which now supports a number of new features. Most importantly, legal opinions are no longer single entities. For example, in the past if we had the lead opinion, a dissent, and a concurrence, we had no choice but to put them all together and make them readable top to bottom on our site. That has been fine, but in our new system we introduce the concept of an Opinion Cluster, which consists of several “sub opinions”. A quick announcement today to share that we’re making Free.law our new home and that we’re launching a new homepage to go with it. If you’re reading this post, you’re looking at the new site! Let us know what you think or if we can improve it somehow. For the most part, it’s a replica of our old site, but we’ve made a few improvements here and there. In general, the layout, typography, security, speed, and reliability should all be better. In addition to the new homepage being live, we also updated our email, so you can now reach us at somebody@free.law. FreeLawProject.org, v1. You can also browse the old site at archive.org. 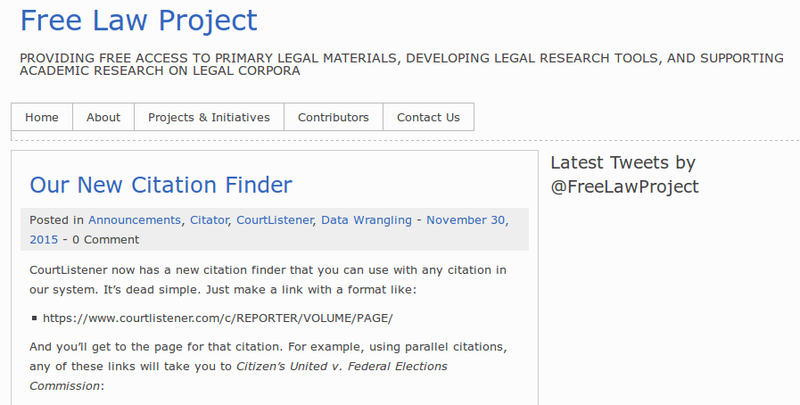 CourtListener now has a new citation finder that you can use with any citation in our system. It’s dead simple. There are two ways to use it. Update: We’ve moved our development conversation over to Slack. If you wish to join us there, please get in touch using our contact form. In general, this will be a normal list where we’ll post any important updates about Juriscraper, but this list will also get one special email per day documenting the status of our 200+ court scrapers. Previously this email was only sent privately to maintainers, but by making it public, we’re hoping to encourage more people to identify and fix the day to day problems that arise with so many scrapers. We look forward to lots more discussion and so much more scraping! An early prototype of the new version. Free Law Project is excited to announce that over the next several months we will be collaborating with the University of Baltimore and Assistant Professor of Law, Colin Starger, to build a web-based version of his Supreme Court Mapping Project, a software-driven effort to visualize Supreme Court doctrine. Currently a desktop software tool, the collaboration will move this functionality to the web, incorporating it directly into Free Law Project’s CourtListener platform. Once incorporated into CourtListener, users will be able to create visualizations of how different cases cite each other, including plotting them against variables from the Supreme Court Database such as whether the case had a liberal or conservative outcome, and the minority/majority votes of the justices. Using the CourtListener citation API, Colin and his partner Darren Kumasawa have done a lot of work in this area already, laying a great foundation for this project. Earlier this year, Carole Hafner, a key figure in the origin and development of AI and Law, died. A tribute to Carole can be found at http://www.iaail.org/?q=page/memorials. A special issue of Artificial Intelligence and Law (which she co-founded) will be published in 2016, focusing on Carole’s main research topics: semantic retrieval and the procedural, temporal and teleological aspects of reasoning with legal cases.